Porcelain, acrylic, cast iron, metal, fibreglass tubs and sinks can all be improved within a few hours by reglazing them. We can change the colour, fix any blemishes, repair chips, polish and reglaze to make your bathtub and sink look brand new. 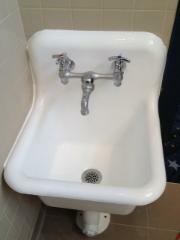 After reglazing, you will be left with a bathtub or sink that looks shiny, new and sure to brighten up your bathroom. Once reglazed, the glossy, smooth surface is easy to clean and will last for years with proper care. Reglazing is a great option and should be strongly considered with cast iron sinks, laundry tubs, old mop sinks and even pedestal sinks. Dr. Tubs Reglazing doesn’t suggest reglazing kitchen sinks, as the glaze isn’t made to withstand the constant impact from cutlery and pots and pans. In addition, reglazing and refinishing paints / chemicals shouldn’t be used around areas where food is prepared. Reglazing is not recommended when there is rust, damage or when there is a metal or plastic lip around the sink. Tub surround tiles can easily be reglazed when doing the bathtub or by itself. Like with tubs and sinks, tub surround tiles are refinished in the same way. Once they are refinished, they will shine and never need grouting again as the glaze seals in the grout. **Please note that there is no warranty offered for sinks or tiles. Dr. Tubs Reglazing provides bathtub refinishing, bathtub, tile colour and repair services in the Greater Toronto Area, Ontario, Canada.